For those of you who don’t know what DBCC WRITEPAGE is, it’s an undocumented command that allows you to make direct changes to data file pages. It’s an extremely powerful command that is very useful for creating corrupt databases, and in extreme cases, for helping to repair otherwise irretrievably-corrupt databases. I blogged about it a year ago in this post. I never advocate using it to repair a corrupt database and then continue using that database in production, and in fact I refuse to do that if a client asks as there are just too many potential problems that could occur. I’ll only ever use it to help recover data from a damaged database, where there’s already a copy of the databases files in existence, and the client has signed an agreement acknowledging that any data file I use it on is a duplicate, is not on a production instance, and changes to it will in no way affect production. There are all kinds of things I’ve used DBCC WRITEPAGE for to allow data recovery to progress, and in my Advanced Corruption Recovery Techniques course on Pluralsight course I demonstrate one of them, which I’m going to describe here. Imagine a database that’s suffered corruption and there’s an off-row LOB data value that’s inaccessible because the owning data row is corrupt. Your mission is to retrieve the data. 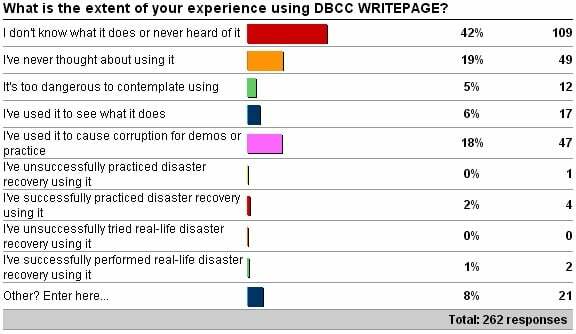 And to make it impractical to manually piece together the value using DBCC PAGE dumps, the LOB value is a few megabytes, so it’s stored on hundreds of linked text pages. Cool, eh? Desperate times call for clever measures, and with procedures like this I regularly recover data from client databases that Microsoft and other data recovery firms either can’t help with or have given up on. It’s not a fast process as it can take quite a while to figure out exactly what to modify to make things work, but when the data comes back, the clients are always ecstatic. And with some knowledge of the data structures in a data file, careful use of DBCC WRITEPAGE, and plenty of practice, you can do it too.